This tour is R400-00 per person, this is a maximum of 10 guests in two vehicles. The tour is done by an Adventure Guide, who is passionate about the industry as well as the guests. The tour covers 14 kilometres and is a circular route. We travel through our natural vegetation, Fynbos. There are so many plant species to identify. We are also known to have a vast variety of bird life and great scenic beauty. 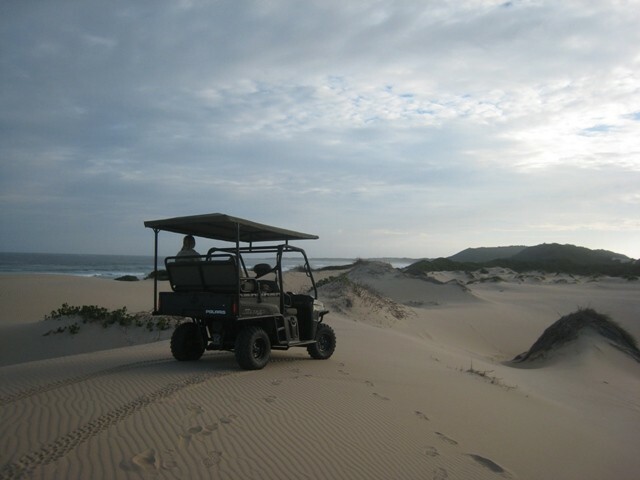 To finish off, a 4x4ing trip is done through the wind-drift dunes and back across the Fynbos vegetation and home. Coming from Port Elizabeth take the n2 to Humansdorp. Take the Humansdorp / St Francis / Oyster Bay exit. After entering Humansdorp, at the first stop street, continue straight and down the main street of Humansdorp. At the bottom of the road turn right to Oyster Bay. Follow the signs to Oyster Bay / Oyster Bay Lodge. Please note that the tarred road will become a dirt road. After approximately 23 kilometers Oyster Bay Lodge is situated on the left-hand side of the road 2 kilometers after the village of Oyster Bay. Coming from Cape Town on the N2 turn off at exit 632 Palmietvlei and follow the signs to Oyster Bay/Oyster Bay Lodge for 24 kilometres (Please note that the tarred road will become a dirt road). Oyster Bay Lodge is situated on the right-hand side of the road.